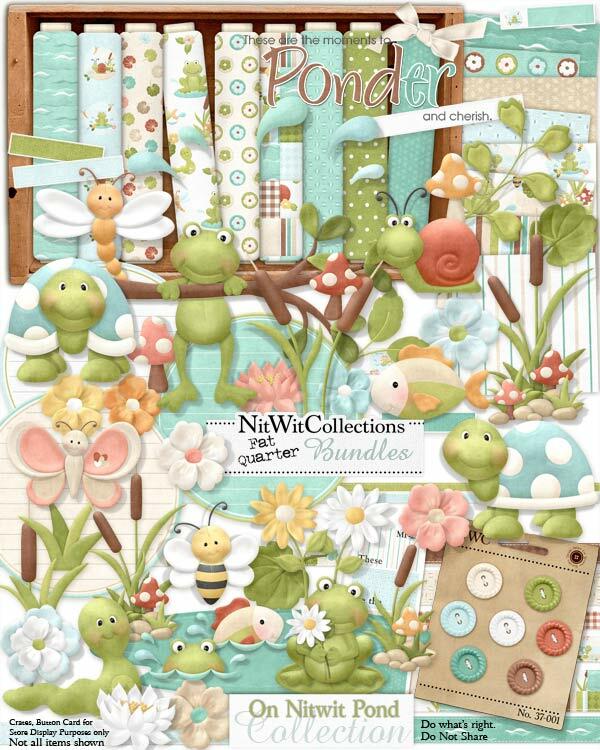 "On Nitwit Pond" Collection lets you bask in the cool waters of this kit! All of the pond critters are ready and waiting to enjoy the day with you...minus the pesky mosquitos and flies, ha,ha! What is your creative spirit telling you to make with this kit?? Is it a friendship card or party invitation, or a scrapbooking layout of a day at the beach or your favorite swimming hole? If you need a little help, take a look at our layout and card on this page....we hope that it inspires you! Now to find the time, cause we know you're thinking about a day off to enjoy your pond! 3 Bows - for your picnic basket perhaps?? 2 Clusters of cattails, grass, mushrooms, etc. It's easier to sometimes place in a finished element. 1 Dragonfly - they don't look like dragons....do they?? 9 Flowers - we couldn't resist picking these and sharing them with you! 2 Lilypads - will you leave them blank on your card or scrapbooking layout or will a critter be perched on them? 3 Mushrooms - non poisonous, but I still wouldn't eat them! 1 Snail - he almost missed getting in the kit...you know how slow he is! 1 Wordart - "These are the Moments...."